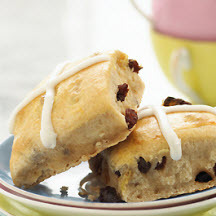 It's an old English tradition to serve Hot Cross Buns on Good Friday, but these sweet buns are good anytime of the year. For Hot Cross Buns: Scald milk; stir in butter and cool to lukewarm. Sift flour with sugar, salt and cinnamon in a large bowl. Stir in raisins until well coated. Stir in eggs, cooled milk and yeast mixture; blend well. Turn dough out onto lightly floured board and knead until smooth and elastic, 5 to 8 minutes Place in greased bowl, turning to grease top. Cover; let rise in warm place until doubled in bulk, about 1 1/2 hours. Punch down dough, pinch off pieces, and form smooth, rounded balls about 1 1/2-inches in diameter. Place balls of dough on greased baking sheet about 2-inches apart. Brush each bun with egg wash. Snip 1/2-inch deep cross in center of each bun with greased scissors. Let buns rise in warm place until doubled in bulk, about 30 minutes. Bake at 400°F (205°C) for about 8 to 10 minutes, or until lightly browned. Cool on wire racks about 5 minutes. Drizzle icing on the cross. For Lemon Icing: Combine 1 cup powdered sugar, 2 teaspoons lemon juice, and 1 teaspoon water; beat until smooth. Nutritional Information Per Serving (1/18 of recipe): Calories: 200; Total Fat: 3g; Saturated Fat: 1g; Cholesterol: 35mg; Total Carbs: 39g; Fiber: 2g; Sugar: 16g; Protein: 5g; Sodium: 160mg; Potassium: 173mg. Recipe and photograph courtesy of California Raisin Marketing Board.